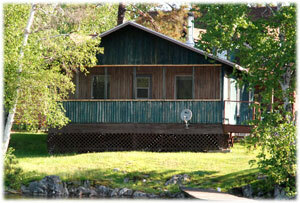 Finding the right accommodations to suit your needs for the perfect vacation is important to us here at Camp Lalucarne. We offer 5 lake front cabins on site, 4 rooms in the main lodge and 2 other lake front cabins located in remote areas on Lake Kipawa. Below are a list of available cabins and their weekly rates, from Saturday to Saturday and based on double occupancy. Check in is 2pm and check out is 11am. Additional persons 11 years and older is $125, and overnight visitors $40 per person. Sleeps 1-8 persons, includes full kitchen (utensils, cookware, microwave, coffee maker), 3 piece bathroom, hot water, TV, satellite, woodstove, firewood, propane BBQ, picnic table and private dock. Sleeps 1-4 persons, includes full kitchen (utensils, cookware, microwave, coffee maker), 3 piece bathroom, hot water, TV, satellite, woodstove, firewood, propane BBQ and picnic table. Rustic 1 bedroom open concept beachfront cabin, kitchen, running water, woodstove, remote access, bring your own boat, outhouse. Riverfront 2 bedrooms with open loft, sleeps 8. Kitchen, full bath and woodstove. Access to Lake Kipawa and Ostabonigue. A $200.00 deposit by Visa or MasterCard is due at the time of booking. Balance due at check in. List all cabin occupants at time of booking, for example, Mr.& Mrs. John Smith, Sue Smith 12yrs, Jason Smith 8yrs. Lodge Rooms - nightly rates and shared bathrooms.